ALL THE TIME GOD IS GOOD! : New Testament Tithing or New Covenant Giving? New Testament Tithing or New Covenant Giving? This New Covenant is a much better Covenant with better promises. Many mistakenly believe this New Covenant began with the birth of Christ. This one error causes many to wrongly divide the Word of God. 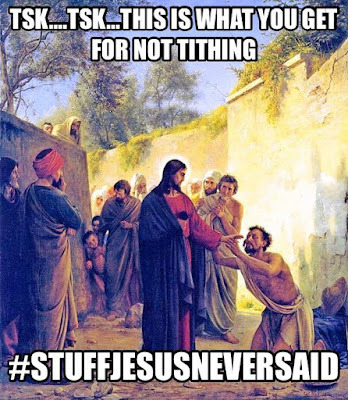 This is one reason this issue of Tithing is so controversial. When we rightly divide the Word we can clearly see that Tithing is an Old Covenant practice. This truth angers the religious traditionists with legalism clouding their understanding. How else can they manipulate and control the people if they know the truth about giving? This truth also excites the foolish who have rebellion driving their motives. They hear the wonderful truth that this obligatory ten percent giving standard is done away in Christ and they take it to mean we should withhold all finances and be stingy and not generous. Is this the motive of spreading the truth about the Tithe? A heart that has been captured by His amazing Grace isn't a heart of rebellion. It isn't a heart burdened with dutiful performance seeking to appease an austere master. It is a heart that has been infused with His very life and love and goodness. It is a heart that has all of Him in all of it. Here is Paul's standard of giving. Give from your heart. Don't give under compulsion or grudgingly. To give grudgingly is to give with reluctance or resentful manner. What would it mean to give this way? There could be several reasons for giving resentfully. Giving grudgingly may happen because one has not understood generosity and they fear giving anything away. To that Paul is saying don't give. It would be better for folk to not give like this because it will only produce bitterness. Understanding God's great love and generosity towards us will help us grow in this area of generosity. Secondly, Paul says not to give under compulsion. Other translations say don't give under pressure, or obligation or under necessity. This proves Tithing isn't the standard. How so, you may ask? Paul says we should give as we purpose in our hearts. Paul says we aren't to give under necessity. How can God expect us to give as we purpose in our hearts if the standard to give is ten percent? Why tell us to give as we purpose if God already has a set standard? Also, if we are to give ten percent this would be obligatory giving and Paul said we aren't to give under these circumstances. In fact, the word Paul used for necessity is a word that means necessity imposed by circumstance or by Law of duty. This is a powerful truth. The Tithing standard requires people to give out of commanded duty and not out of a heart of loving devotion and generosity. When the love and amazing Grace of God flood our hearts and minds we are changed. We are remade righteous and perfectly holy and acceptable and pleasing to our Father. Our hearts begin to reflect the Father's love. In this loving interaction between our Father, we are able to freely give to meet the needs of others, to promote this beautiful life changing message, and alleviate suffering in this fallen World. Tradition places a burden upon the people seeking their compliance and blind obedience. They reject these plain truths revealed from the Word. Some have said when you Tithe there will be meat in God's house. They define this meat as "revelation" from the Word. The point is to drive some fear into the hearers that if they fail to Tithe then they won't be able to receive the truths from the Word of God. This is the detestable control tactics of religion. This clearly violates plain Scripture. We are not to give under obligation or pressure. God loves you and He isn't hiding Himself from you. He was made an open shame for you in the Finished Work. Religion tries to veil this beautiful Grace of our Lord Jesus. His love and Grace won't be contained. He is revealing Himself more and more. In summation, we should freely give under the leading and guiding of a loving Savior. If you've been giving ten percent and it is not a burden to you should you immediately stop? Don't allow any man to dictate what you should give or not give. Let God be God in your life. Allow Him to lead you in how much to give. People are fearful if there is no Tithe then how will ministry be accomplished? People would give if they knew there 2% or 8% was just as holy and acceptable as 10%. Let's let the Spirit teach and direct His children. If you study the Scriptures, from Acts to the Epistles you will see God's heart for giving. People gave to meet the needs of others. They gave for disaster relief. They gave to support the ministry of the gospel. They even supported those preaching the gospel. One last note. Yes, it is Scriptural to support a local church. It is Biblical that a minister receives a salary for their duties if they are a full-time minister. However, if you see ministers flaunt wealth, and seem to be all about the cash, I would flee a place like that. Don't support lavish lifestyles with promises made by them if you give then God will make you rich. This is a religious sham designed to relinquish your money from you. Don't allow religious tradition to bind you. Don't give into rebellion and cling tightly to what is yours and end up being greedy. Don't fall for the scams of religious trickery. Give out of a heart of love to promote the beautiful gospel of Jesus and see the captives set free by His Grace. God be glorified in you, sir. The truth sets free indeed. Amen. So glad this blessed you. Let God be God in people's life. Thank for preaching truth, l was so blessed and liberated by your artcle. We are now under grace not law. Glad it has blessed you. Must we Tithe our way to blessings? Is Tithing in the New Covenant? Tithing Under Grace, Or Under Law?